Your next laptop will most likely be thinner than the one you have now. That’s because some Windows PC makers like HP aren’t keen with the thinness of even their own offerings. So, their designers and execs have gone all-out to design (with some compromise) an ultrabook so thin, it beats the MacBook by 0.1 an inch — I wasn’t keeping track of decimals, either. At that level of thinness — 10.4mm to be exact — long battery life and ports are the first things to get axed. But HP’s Spectre tries to beat the odds and, as it turns out, comes pretty close. The HP Spectre is by default, a unique experience. For the first time in a while, an ultrabook has come along that is mildly different in aesthetics, but also beautiful to look at. While showing the Spectre to people I mostly heard praise for the sleek design. After all, 10.4mm is pretty thin, and the contrast of the copper and grey/brown aluminum is worth the extended glance. Once you pick it up, the Spectre immediately falls between a precious item and a good tool. A carbon fiber underside, with unibody aluminium everywhere else, ensures that the Spectre really does feel polished and premium, without being gaudy. You don’t have to question HP’s design chops: they’re quite real. 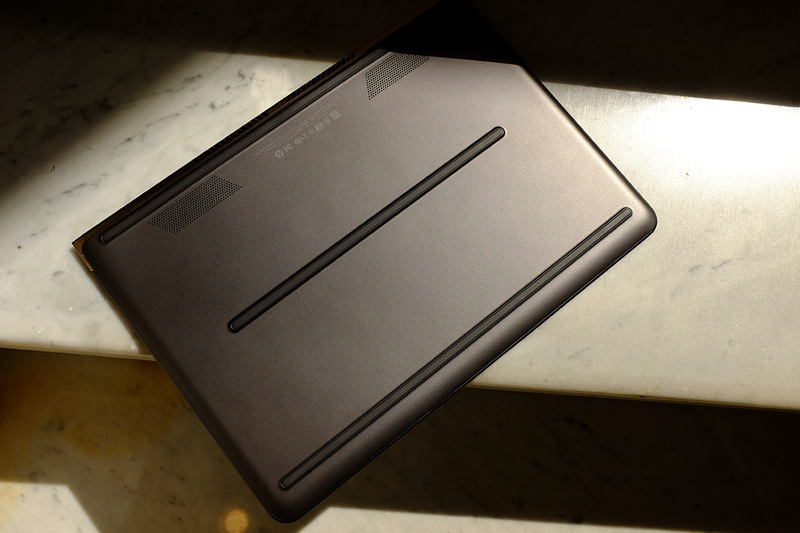 For the first time in a while, an ultrabook has come along that is mildly different in aesthetics, but also beautiful to look at. HP even finessed the hinges, which use pistons and are reminiscent of kitchen cabinets, but also some expensive furniture. There is a con with this however, and that’s not being able to push the screen too far back; however this con is subjective to your viewing angles. So now, we get it: The Spectre has a great screen despite its numbers, a keyboard that’s probably one of the best in class and B&O speakers that do an alright job for watching a YouTube video. Plus, despite the limited port selection, the three all-purpose USB-C/Thunderbolt ports are open to expansion via multiple USB-C port docks that HP sells. What could be the one thing I can’t stand about the Spectre’s performance? Its battery life. The sheer thinness shaved two or three hours off of what could have been an ultrabook that lasted 9 hours on a charge (see: MacBook Air). Between six and seven hours of continuous Chrome and Spotify usage isn’t bad, but it’s not the best at all — as with most laptops, your mileage can (and will) vary. Side note: the trackpad is accurate, smooth and entirely usable, but much too small. In fact, it’s nearly stifling. If it couldn’t be taller, I’d have appreciated if it was at least wider. 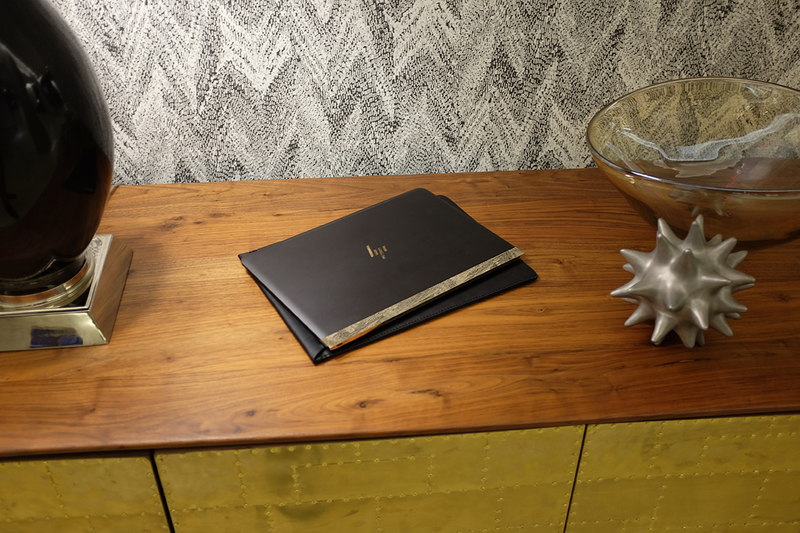 The HP Spectre is plenty of good things, but being perfect isn’t one of them. Firstly, the heat generated by the Core i7 processor is not a major issue, but here’s the deal with the Spectre: it has to be kept ventilated through the bottom, where the intakes bring in air, so that the positive pressure cooling system can do its job. It would have been perfect if it stayed cold to the touch — thermodynamics can indeed be a tricky thing. That means using it on tables, avoid laying it flat on a bed and probably always ensuring it’s always well-ventilated. That’s a chore, yet one that usually takes care of itself given that laptops are great on tables, but that just isn’t the usual scenario in the real world. What if the Spectre does get hot? If it happens, it’s not unbearable: the palm rests stay cool, while the area near the power button and the carbon fiber underside can become toasty, including fan noise. Ultimately, I think heat dissipation that works this well on a real Core i7 in a system this thin has to be commended. It would have been perfect if it actually stayed cool to the touch, but it doesn’t — thermodynamics can be tricky. The takeaway here: An ultrabook being too thing for its own good is possible, especially with current-generation processors. Though it might get toasty on its undersides (if under strain), it’s a great first effort at making an ultrabook of this quality. 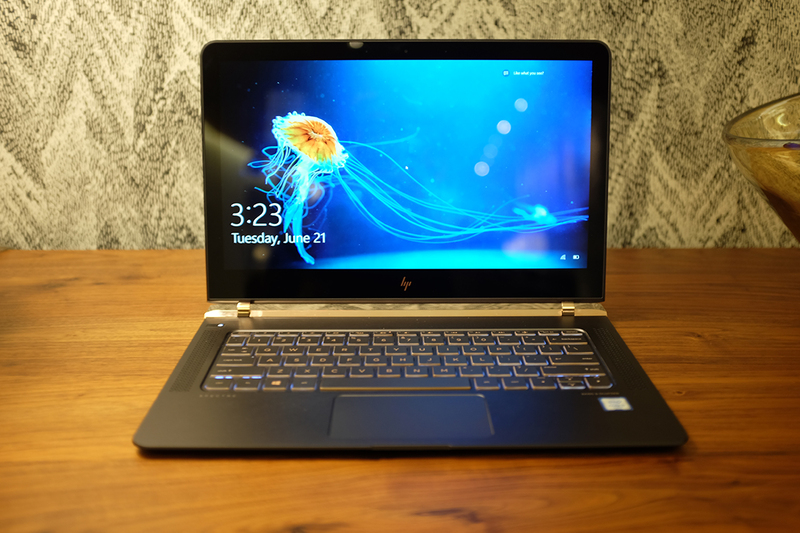 For a “premium device,” HP’s Spectre 13 is designed well and priced fairly. Though it might get toasty on its undersides (if under strain), it’s a great first effort at making an ultrabook of this quality. In terms of marketing, it may be suitable for more than a few “millennials” who value design and thinness over extra ports or quad HD screens. In short, a laptop like the Spectre could be the right fit… for some of us.